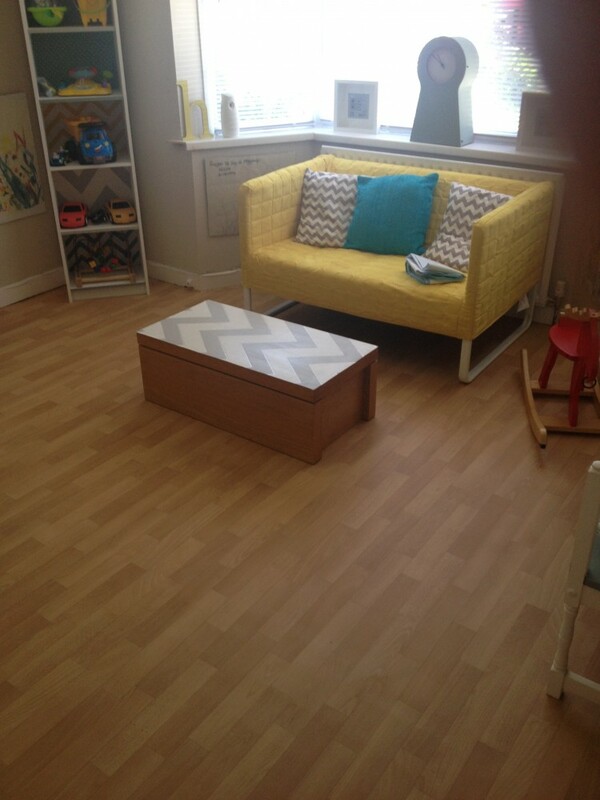 This is how the playroom looked before. The wall were a very boring Magnolia! Something had to be done! I’ll take you through a virtual tour of the different areas. 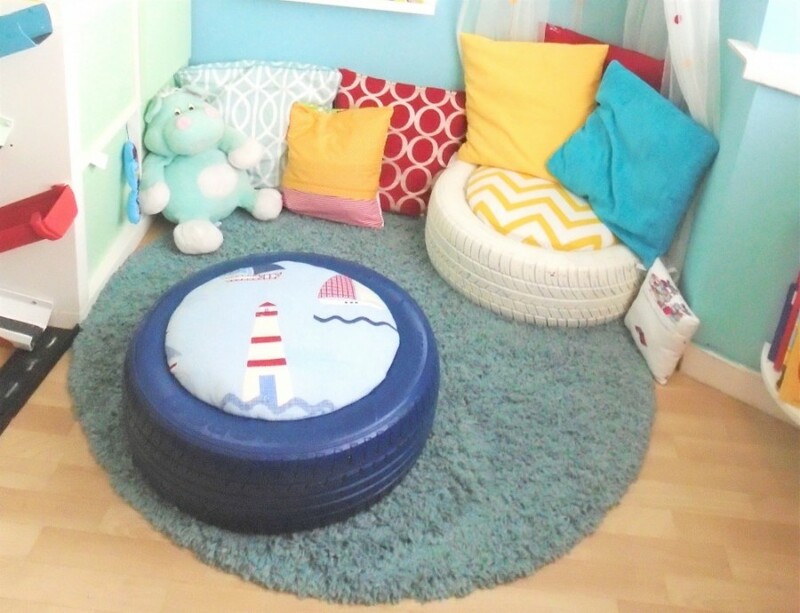 This reading nook was created using tyres as the main seating area (see tutorial for kids seating here). 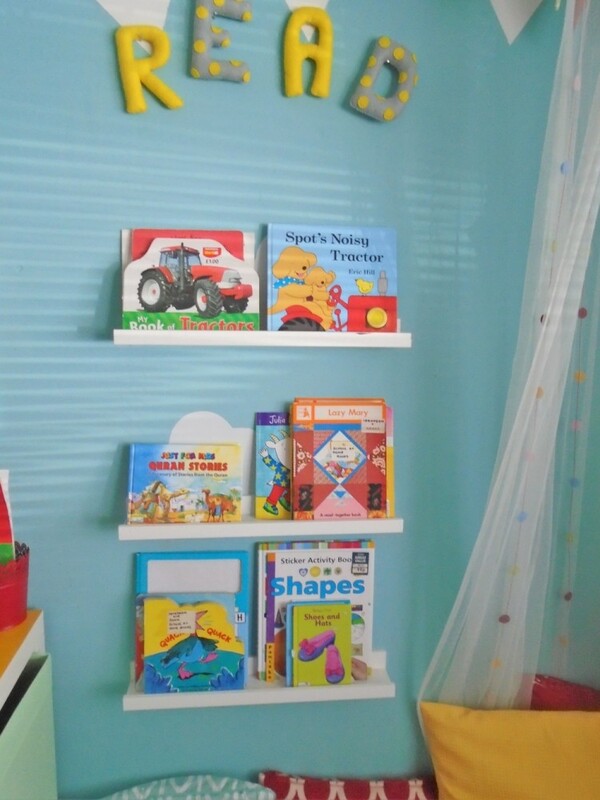 We used IKEA RIBBA ledges as the book shelves and the IKEA KALLAX cube to separate the area off. 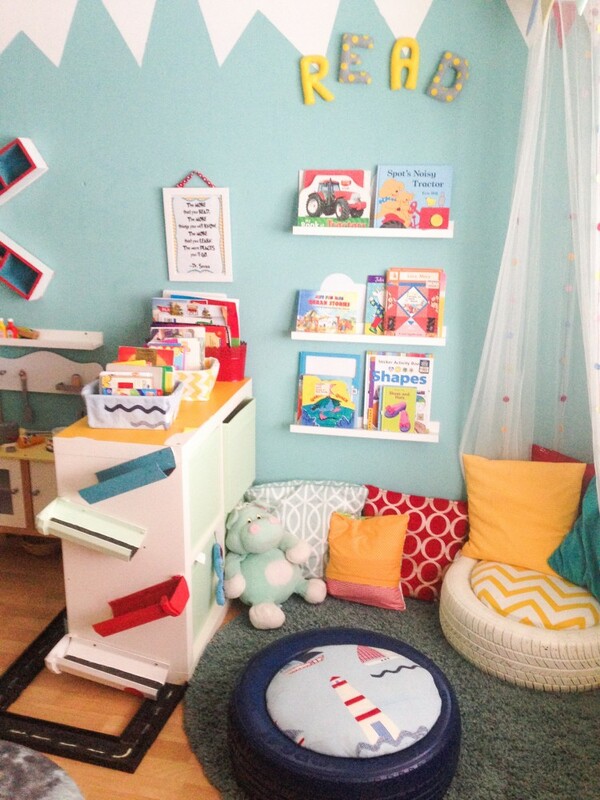 We also added some colourful cushions, a comfy rug and baskets for book storage! 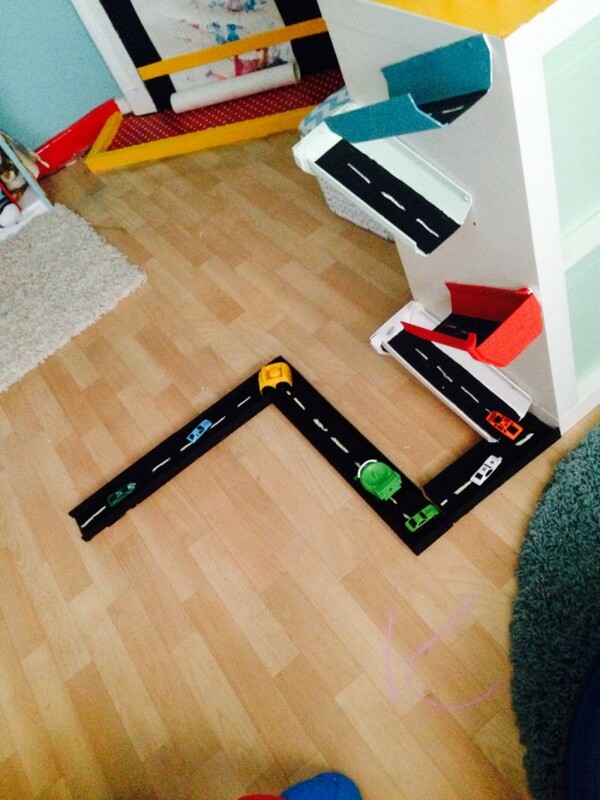 My son struggles with imaginary play, however a part of his learning developments targets set by his speech and language therapist included trying to encourage imaginary play, whether he participated it or not. 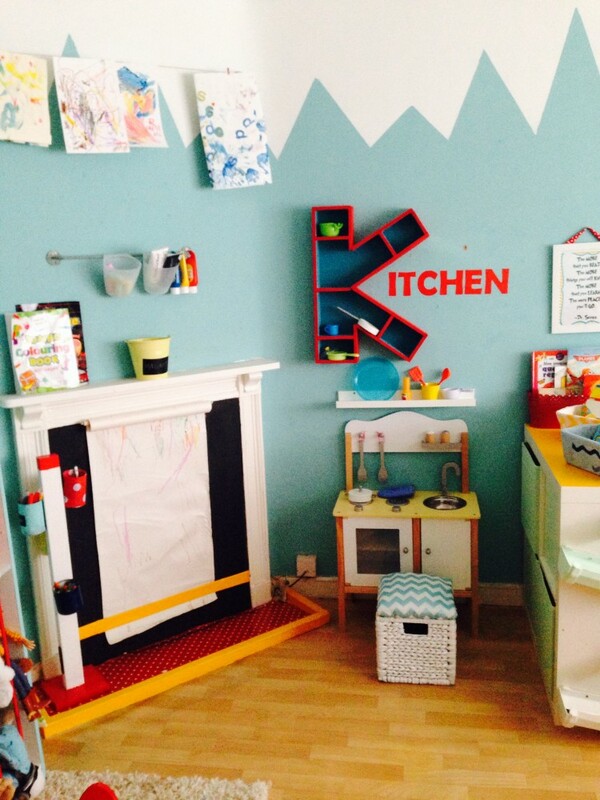 So, I bought him this play kitchen and set the whole area up to look like a cooking zone The K on the wall which stands for Kitchen was designed by me and built by my husband (under my careful instruction of course!). 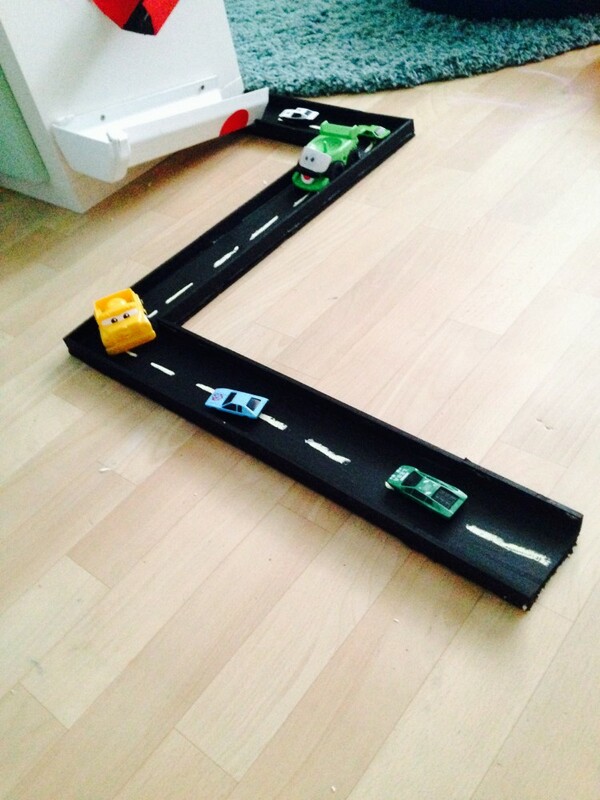 When my son hit the age of two he went through an obsessive Toy Story craze. 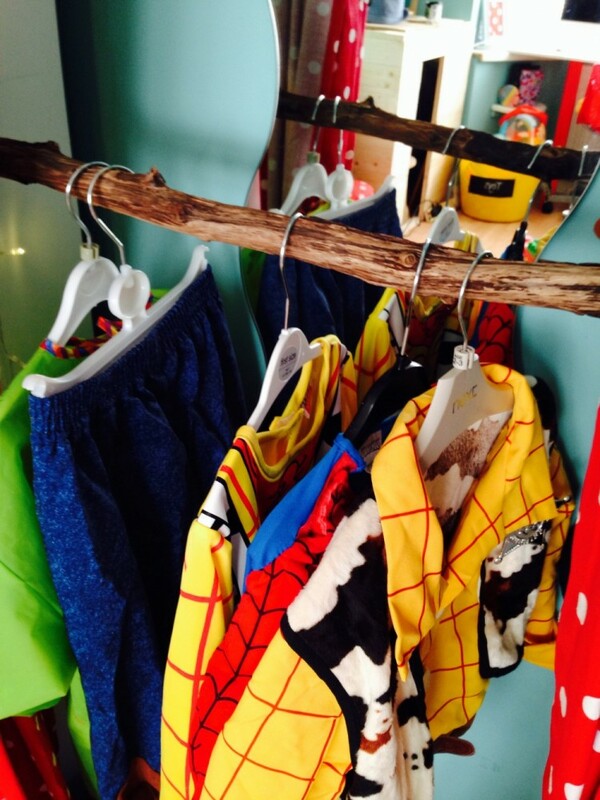 He loved everything Woody, Buzz, Andy and Woody (I mean to repeat myself here – that’s how much he loved the little cowboy!). 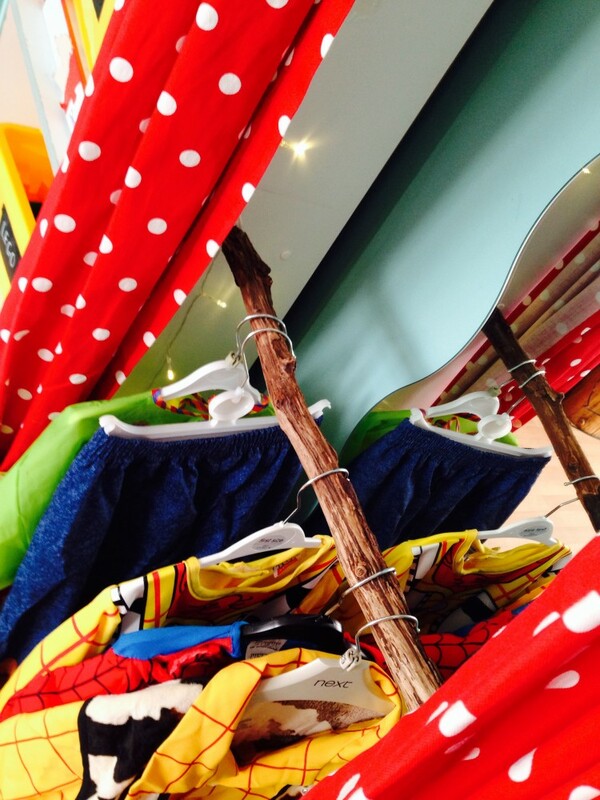 He had a quite a few woody outfits along with various other superhero outfits. 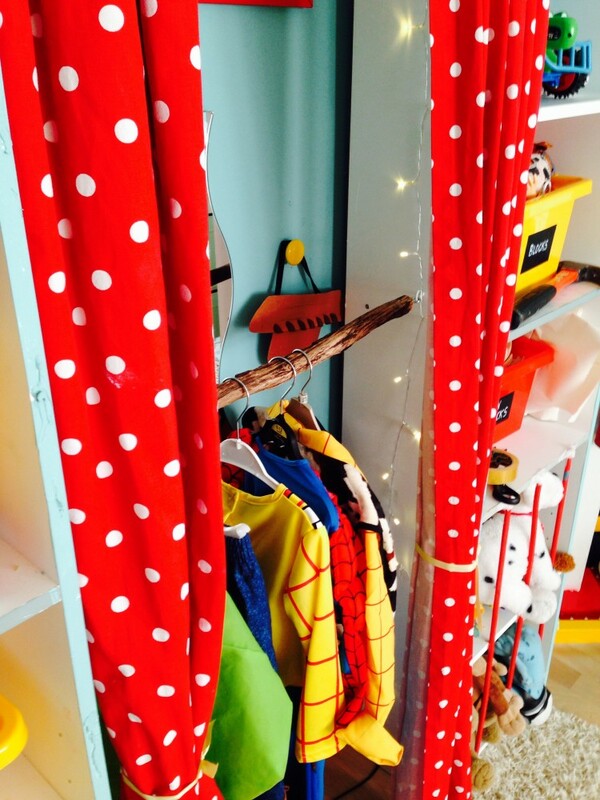 To create this area I screwed in a rail (well it was just a piece of driftwood really) between two bookshelves and hung up some red polka dot curtains. 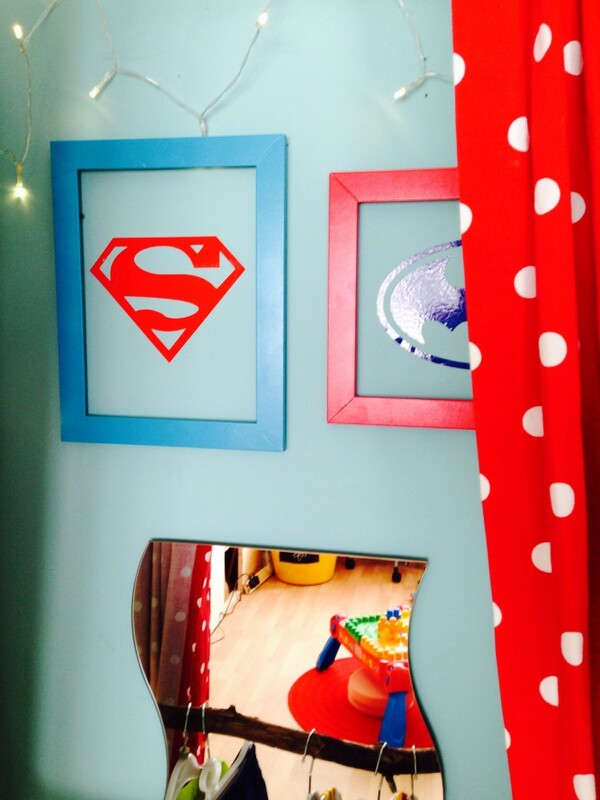 I then added in some lights and a mirror to give it a glamour/celebrity dressing room type feel (I chuckle here). 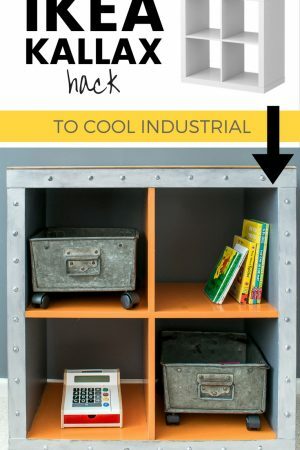 By utilizing the space between the bookcases, I managed to save a lot of space. 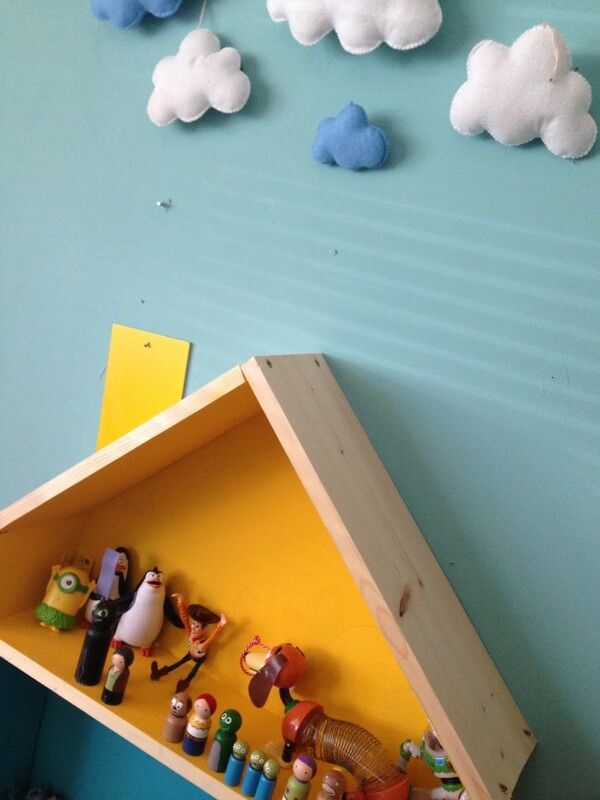 It meant I could use the bookshelves to store his toys and various other bits and keep things organized! 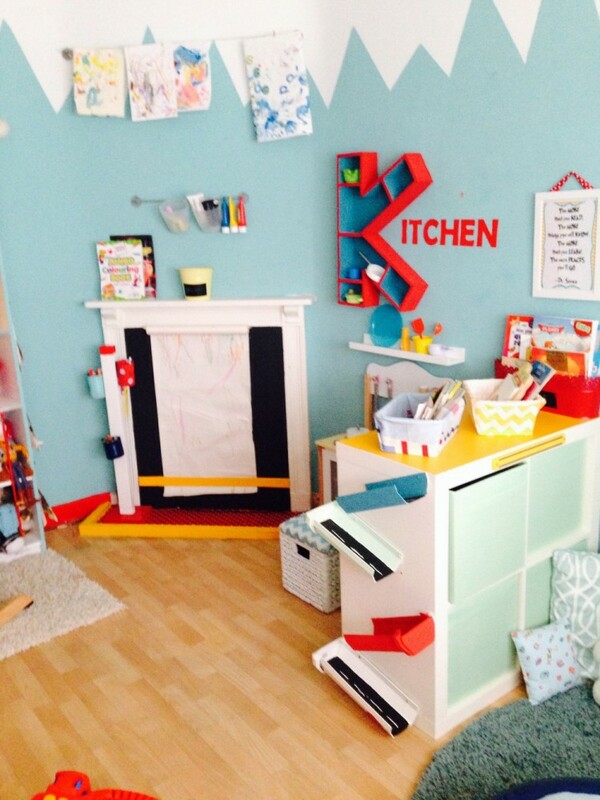 This area was fun to create! 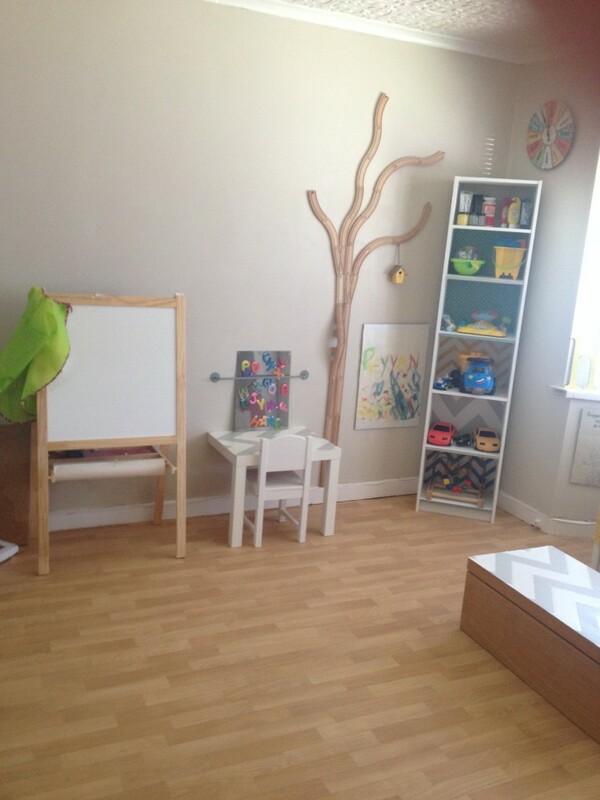 I think every child needs that corner where they can be creative and artistic. 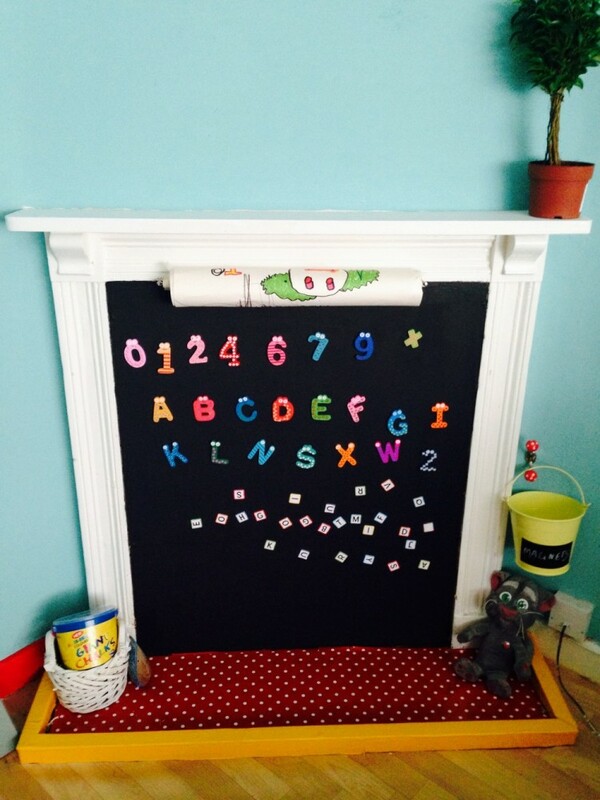 As you can see the drawing/magnetic board here is in the actual fireplace. 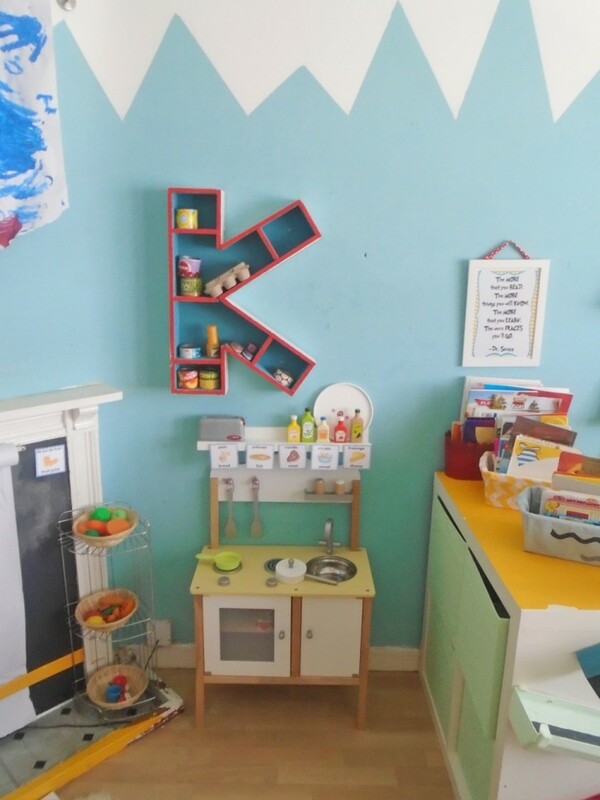 We boarded it up with large piece of MDF wood, and then painted it with DULUX magnetic paint (that was a nightmare might I add – it took about 7 coats to get it magnetic!). I hung a roll of IKEA drawing paper to the top using a dowel rod and slid the paper under a piece of thick cardboard to keep it in place. 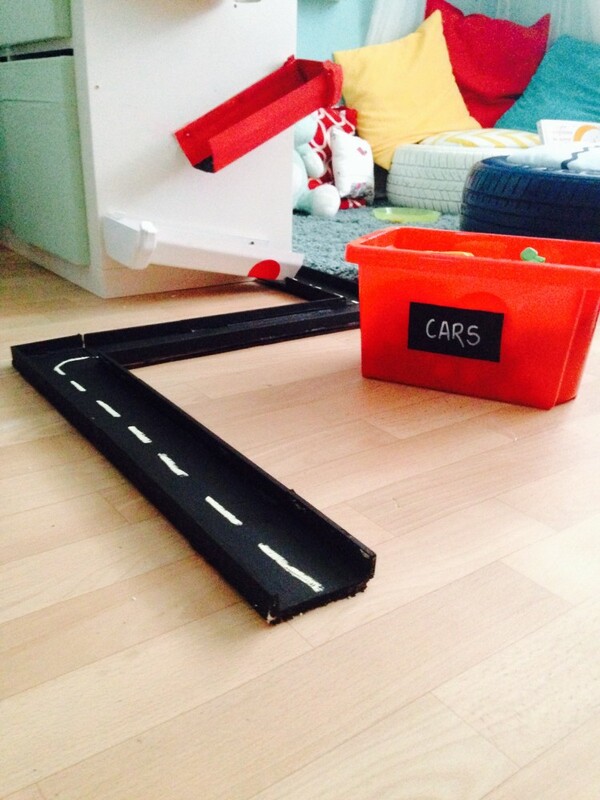 The ramps where made using guttering pipes. 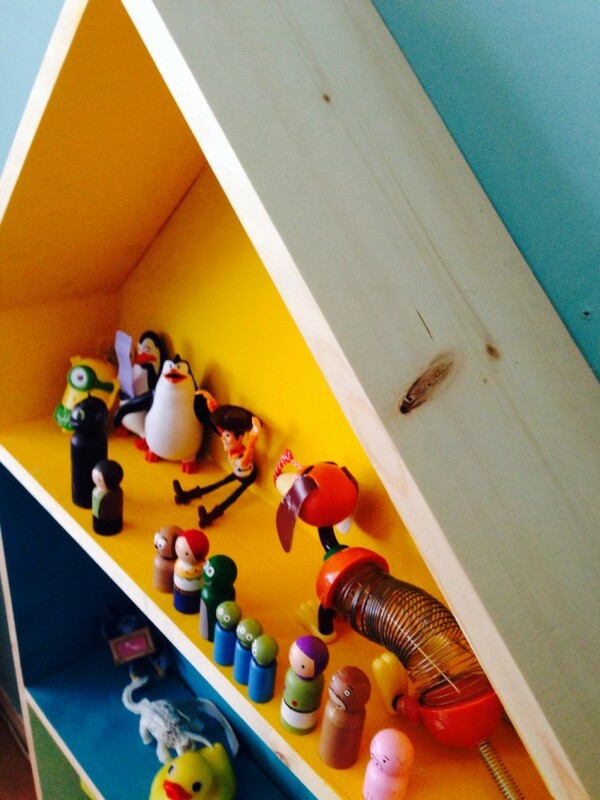 I painted them as seen in pictures and attached them at an angle off the side of the IKEA KALLAX cube. 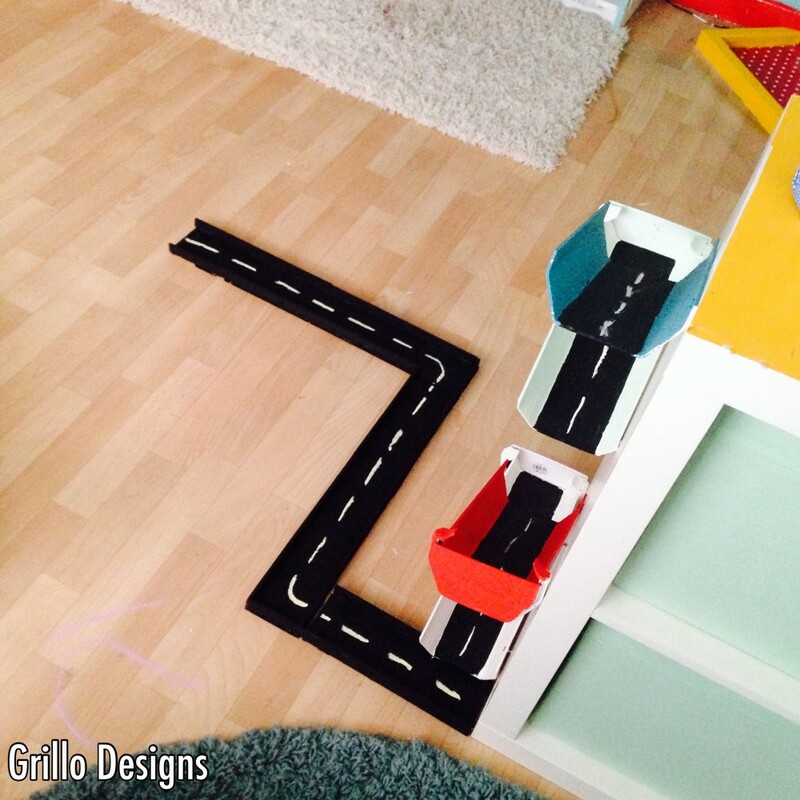 To make the road ramp, I used timber floor boards and chalk painted them. Still a project that needs to be completed. Its meant to have a door and little doll house windows! This is so cool! All the hard work and effort you put in over 5 months, must be definately worth it, looks amazing. I’m sure your son is loving it too. 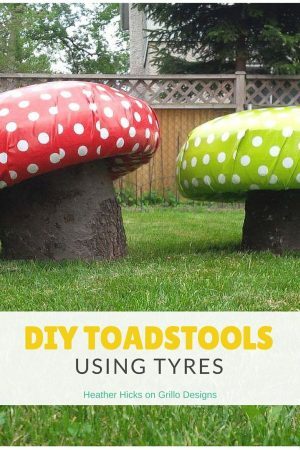 I especially love the mushrooms seats, very cute! 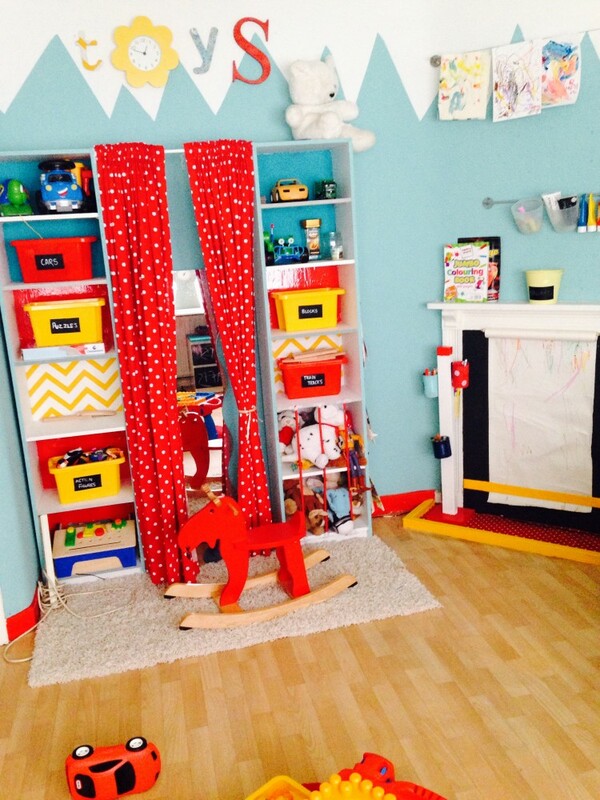 This is exactly how I’d want my playroom to look. It’s adorable. 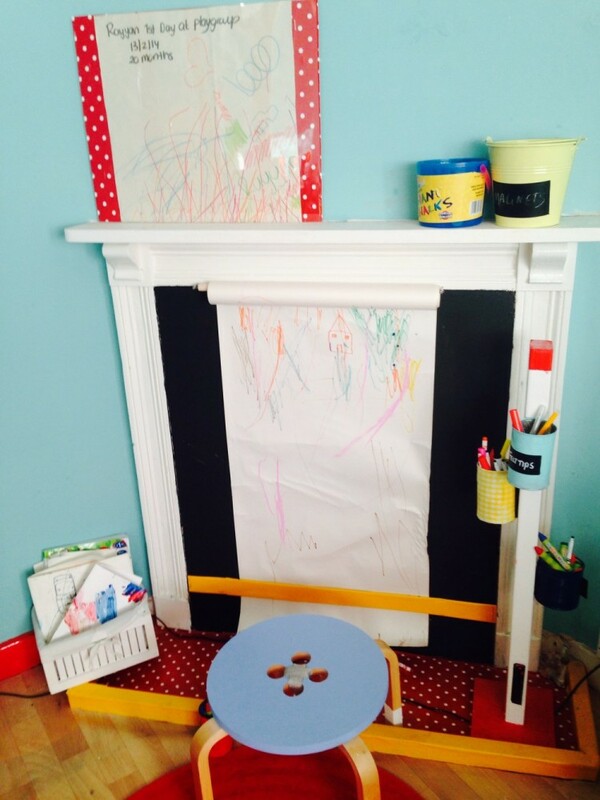 I love the little toadstool seats and art fireplace! I’ll pin these idea for later. I am in awe of this! 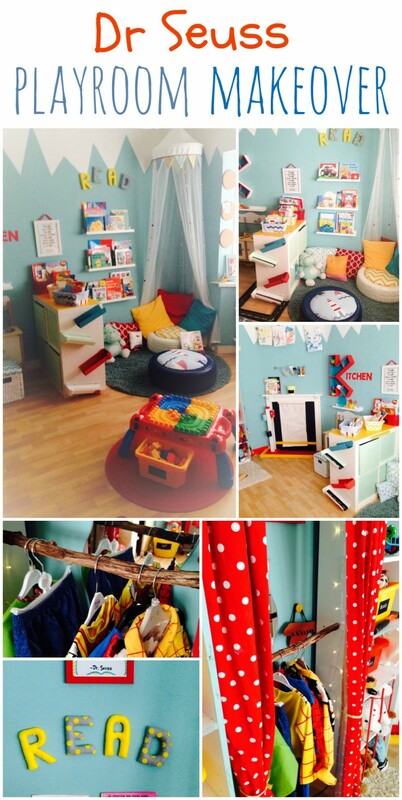 I wish I had a play room like this as a kid! 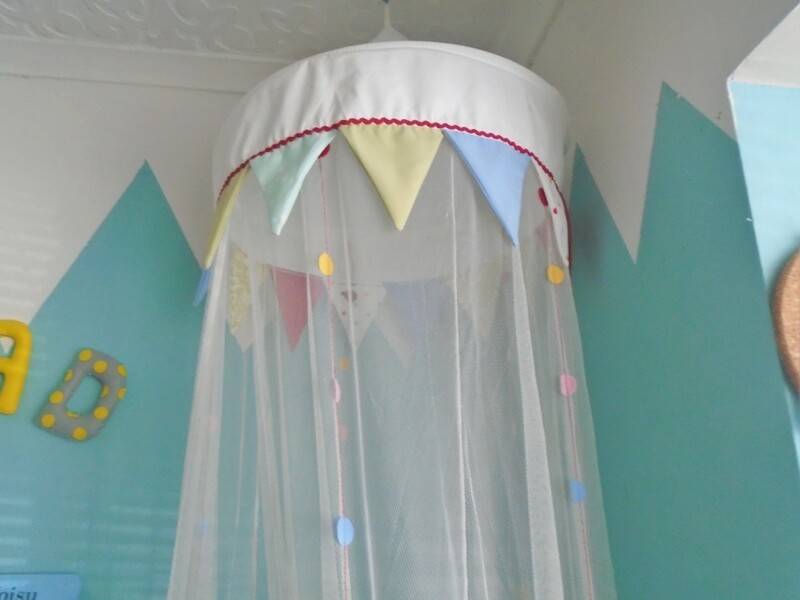 I’ve barely begun my daughters room decorating but now after seeing your post I had loads more ideas! 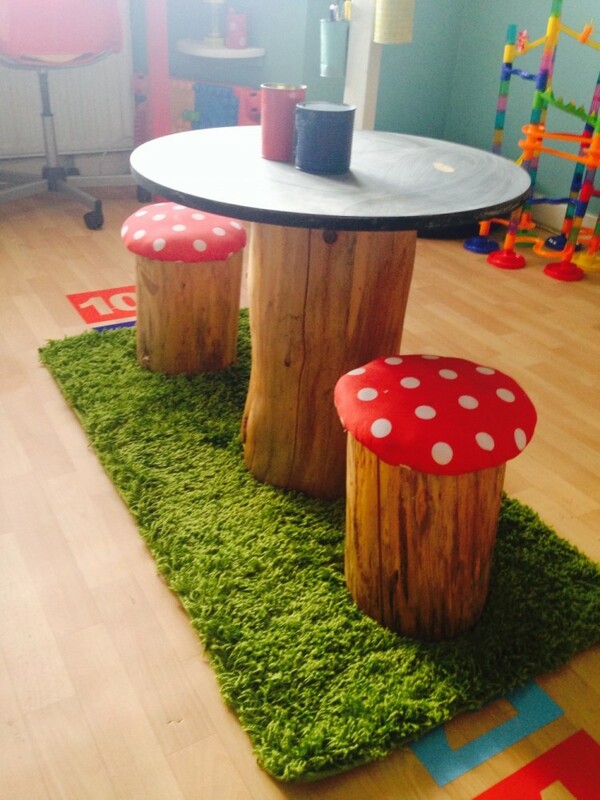 You are amazing by the way, love the toadstool chairs & table!!! Medina , you are very tallented and i want to ask how do you get your motivation and how do you start,cause i have sooo many ideas but none of it is put into action. Thank you so much Dalia. I Really appreciate your comment. 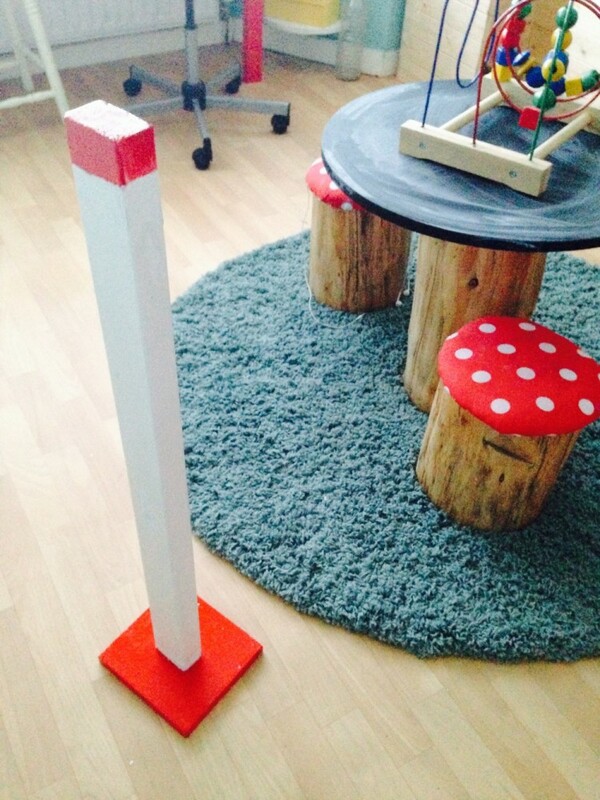 My son is usually what motivates me most days. I enjoy seeing him playing with the things I have made.